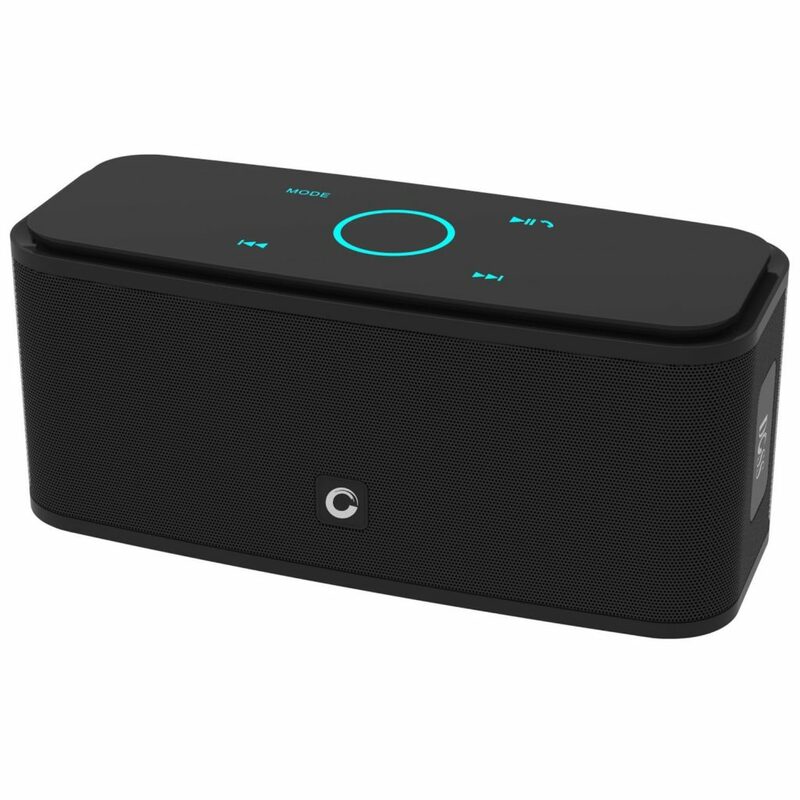 If you want a wireless speaker that produces good quality at a low price, try DOSS SoundBox Bluetooth 4.0 Portable Wireless Speaker. It is a well-designed wireless speaker and considered one of the hottest wireless speakers on the market today. Available in black, blue, red and white, DOSS SoundBox Bluetooth 4.0 Portable Wireless Speaker is a rectangular shaped speaker with curved corners. They have covered the speaker with a speaker grill which lets the sound can go through any part of the speaker. One great feature of this wireless speaker is that the top panel has a capacitive touch control. You can directly manage your tracks with just a touch of your fingertips. 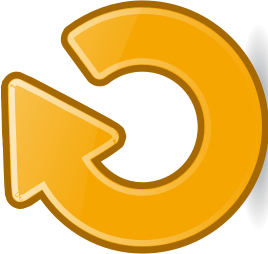 Rotate the highlighted circle to adjust the volume level. Touch other parts that are surrounding the ring to switch from play modes skip tracks and play or pause tracks. It is a well-designed wireless speaker that produces good quality at a low price. On one side of the speaker, you can see the power button, AUX in, micro SD card slot and the charging port together with its indicator. You can also use DOSS SoundBox Bluetooth 4.0 portable wireless speaker as a speakerphone via the integrated microphone. This wireless speaker from DOSS provides a reliable and consistent sound quality. The dual high-performance speaker drivers and 12W stereo help provide audio quality. The passive bass radiator gives that extra kick when listening to bass-heavy songs. You will totally enjoy any genre of music played through the speaker. We all hate tangling wires. Good thing this wireless speaker has a Bluetooth connection you can play music wire-free. Pair Bluetooth-enabled gadgets and play music from the audio source to the speaker. The maximum Bluetooth distance is 10 meters. Choose to play music through micro SD card via the TF card slot at the side of the speaker. Via the auxiliary port, you also have the choice to play music from non-Bluetooth gadgets. DOSS SoundBox Bluetooth 4.0 Portable Wireless speaker’s rechargeable battery allows you to indulge in 12 hours of continuous music play time. The package includes a charging cable you can use when the battery drains. The approximate charging time is 2-3 hours. You can never get quite something like this from other wireless speakers. 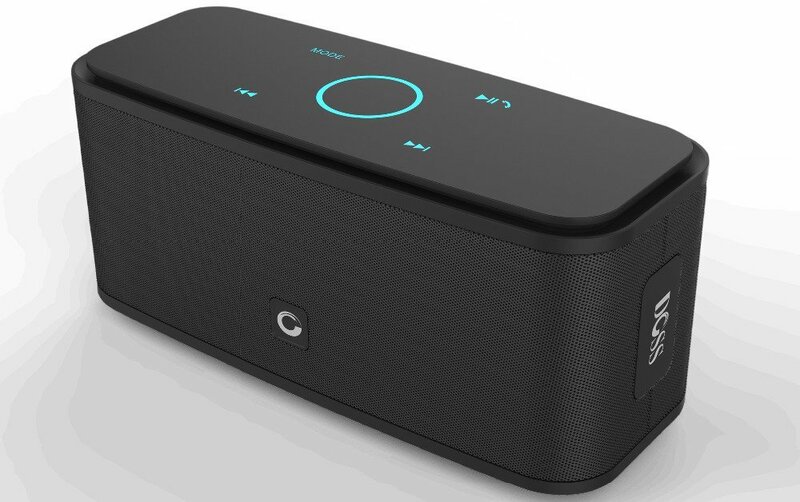 Priced under $50, DOSS SoundBox Bluetooth 4.0 Portable Wireless Speaker is a wonder. This wireless is a great buy! DOSS SoundBox wireless speaker produces such good sound quality. I find the voice prompt helpful. The touch control panel is a great feature. I don’t have to find certain buttons to adjust my volume. It can accurately read finger gestures.